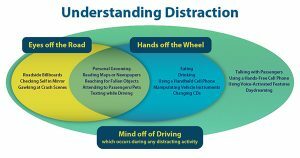 Infographic about distracted driving and what constitutes a distraction. There isn’t a Mother’s Against Distracted Driving group yet, but maybe there should be because the risk of a crash while driving distracted is said to be a worse problem than while driving drunk. The problem is so bad that the American Automobile Association, the U.S. federal government and other groups have campaigns to combat the problem. Distracted driving is very risky and is known to lead to fatal car crashes. NHTSA estimated in 2012 that distraction was a factor about 10 percent of all fatal motor vehicle crashes and 18 percent of all crashes causing injury. The exact toll is unknown because Investigators often have difficulty measuring the extent to which driver distraction is a contributing factor in a crash. Wireless device records are usually only accessed in cases of death or serious injury, drivers may not admit fault and police may not always be able to discern the role of distraction. Methods of reporting are improving, but current estimates likely underestimate how frequently distraction causes crashes. The National Highway Traffic Safety Administration says in 2015 distracted driving cost the lives of 3,477 people and injured another 391,000. According to the 2013 Traffic Safety Culture Index, 83 percent of motorists rated texting while driving and 58 percent rated cell phone use very serious threats to their safety, yet many admitted performing these distracting behaviors while driving within the previous month. Further, 88 percent of respondents said that distracted drivers were somewhat or a much bigger problem today than they were just three years ago. An especially pernicious type of distracted driving is cell phone use. Using the phone while driving quadruples the risk of a crash, AAA says. And hands-free phones give little to no benefit as compared to hand-held phones. AAA states boldly that drivers should not use cell phones while driving. Reasons given for texting and driving range from wanting to stay connected to family and friends, out of habit, worry about missing out on something, and some said they do it because they are anxious if they don’t see a text right away or that they feel gratified if they see it. Three doctors at Kern Medical Center looked at 523 local traffic deaths since 2009 where the deaths were immediate. In more than half the deaths, according to police data, the driver’s blood alcohol content exceeded the legal limit. In 45 percent, excessive speed or texting were evident. Only 15 of the deaths were attributed to bad weather. And 20 percent of the people in all cases studied were not wearing a seat belt. It’s probable the problem of distracted driving has grown since then despite the many campaigns and individuals trying to bring attention. Sadly, the problem of distracted driving is known even to those who do it, but they persist in the risking behavior. If you’ve been injured in a distracted driving accident, attorneys at Krasney Law firm can help you recover some monetary damages and get your life back on track. 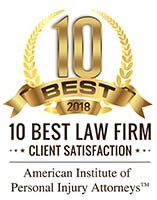 If you are unfortunate enough to be injured or lose a family member in a texting or distracted driving accident, please contact the team at Krasney Law: Personal Injury Specialists in Southern California and Redlands so we can quickly get to work investigating your case. 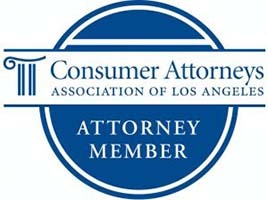 Time is of the essence in pursuing the compensation you deserve, especially if there has been a death. The initial consultation is free, and we collect no fees unless there is a monetary recovery or your case goes to trial and we win. The fact is that even if we collect a contingency fee, you are likely to receive more compensation than if you deal with the insurance companies on your own. The insurance companies are a business and they are known to rip you off.